Background and aims Sensitive outcome measures to assess the efficacy of therapeutic interventions in patients with cystic fibrosis (CF) with mild lung disease are currently lacking. Our objective was to study the ability of the lung clearance index (LCI), a measure of ventilation inhomogeneity, to detect a treatment response to hypertonic saline inhalation in paediatric patients with CF with normal spirometry. Methods In a crossover trial, 20 patients with CF received 4 weeks of hypertonic saline (HS) and isotonic saline (IS) in a randomised sequence separated by a 4 week washout period. The primary end point was the change in the LCI due to HS versus IS. Results Baseline characteristics including the LCI were not significantly different between both study periods. Four weeks of twice-daily HS inhalation significantly improved the LCI compared with IS (1.16, 95% CI 0.26 to 2.05; p=0.016), whereas other outcome measures such as spirometry and quality of life failed to reach statistical significance. Randomisation order had no significant impact on the treatment effect. Conclusions The LCI, but not spirometry was able to detect a treatment effect from HS inhalation in patients with CF with mild disease and may be a suitable tool to assess early intervention strategies in this patient population. There is increasing evidence that cystic fibrosis (CF) lung disease which is responsible for a shortened life span in most patients begins shortly after birth and progresses even in the absence of clinical signs and symptoms.1–6 As a result, there is an increasing emphasis on early intervention strategies to prevent lung damage.7 Forced expiratory volume in 1 s (FEV1) has traditionally been the main outcome measure in therapeutic intervention studies. However, its use in young patients with mild CF lung disease is limited by its insensitivity to peripheral airways disease and the need for active cooperation to perform the manoeuvre.8 Therefore, more sensitive and easier measures of lung function are needed for clinical studies in younger patients with CF with mild disease. The lung clearance index (LCI) is a measure of ventilation inhomogeneity determined during multiple-breath washout (MBW). Cross-sectional studies done to date in patients with CF suggest that the LCI is more sensitive at detecting lung disease than spirometry.9–15 The LCI is determined during tidal breathing and the normal range is consistent across the paediatric range beyond infancy.9–15 The LCI is a potentially useful end point for clinical trials in patients with CF with mild lung disease, but data from interventional and longitudinal studies with the currently used equipment are lacking. 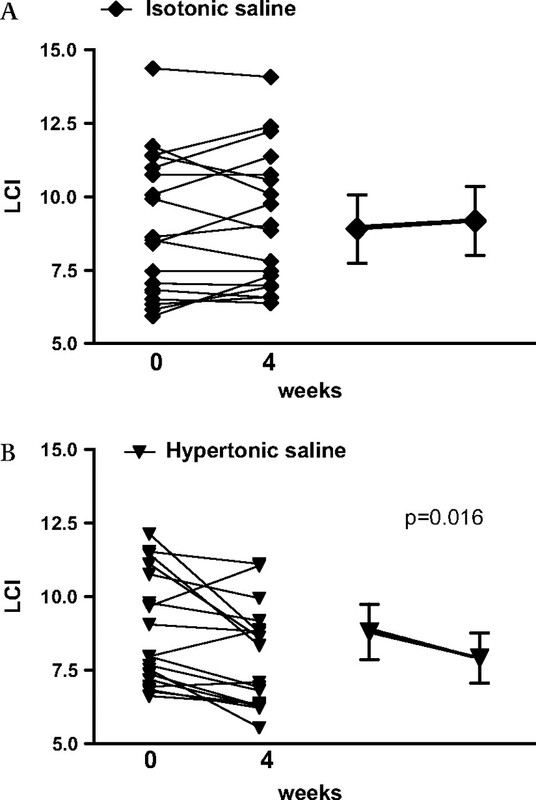 Hypertonic saline (HS; 7%), a therapeutic intervention for patients with CF, is believed to target a direct consequence of cystic fibrosis transmembrane conductance regulator (CFTR) dysfunction, airway surface dehydration, and has previously been shown to increase mucociliary clearance, improve FEV1 and decrease the number of pulmonary exacerbations.16 17 Due to its mechanism of action, HS is an attractive early intervention strategy, but has never been studied in patients with CF with normal lung function due to the difficulty in assessing its efficacy. Therefore, we designed a study to test the effect of inhalation of HS in paediatric patients with CF with normal spirometry (FEV1) using the LCI as the primary outcome measure. Our research hypothesis was that amongst paediatric patients with CF with mild lung disease (ie, FEV1 % predicted ≥80%), 4 weeks of HS (7%) inhalation as compared with 4 weeks of isotonic saline (IS; 0.9%) inhalation will improve the LCI. Eligible patients had a confirmed diagnosis of CF; were between 6 and 18 years of age; were able to perform reproducible spirometry; had a baseline FEV1% predicted ≥80% at the screening visit; and had an oxyhaemoglobin saturation of ≥90% on room air. Exclusion criteria included airway cultures yielding Burkholderia cepacia complex in the previous 2 years or non-tuberculous mycobacteria in the past year; oral corticosteroid use; oxygen supplementation; lung transplantation; intravenous antibiotics or oral quinolones within 14 days of enrolment; or investigational drugs within 30 days of enrolment. The study was approved by the institutional review board of the Hospital for Sick Children and by Health Canada. All tests were performed in the pulmonary lung function laboratory at the Hospital for Sick Children, Toronto, Canada between March and December 2008. This was a 12 week crossover trial consisting of two 4 week treatment periods separated by a 4 week washout. Study visits occurred at 0, 4, 8 and 12 weeks after randomisation. At a screening visit, demographic characteristics, clinical data, physical examination and spirometry were recorded. Eligible participants were assigned to a treatment intervention (ie, HS in period 1 versus IS in period 1) by means of a concealed, computer-generated randomisation performed by a research pharmacist not otherwise involved in the study. Clinicians and research personnel remained unaware of the treatment assignments throughout the study, including the primary efficacy analysis. The solutions were indistinguishable from each other in appearance but not in taste. The solutions were administered using the PARI LC Star nebulizer (Pari, Midlothian, Virginia, USA). Patients received either 4 ml of HS (7%) or IS (0.9%) twice daily for each 4 week treatment period. Two 100 μg puffs of salbutamol (Ventolin) were administered before each inhalation of study solution using a holding chamber (Aerochamber Max, Trudell, London, Canada). See the online supplement for additional details. The LCI, spirometry and the Cystic Fibrosis Questionnaire-Revised (CFQ-R) were completed at each study visit. The LCI was performed first followed by the CFQ-R and then spirometry. LCI was the primary outcome. Secondary outcome measures included: FEV1, forced vital capacity (FVC), forced expiratory flow at 25–75% of the forced vital capacity (FEF25–75) and the CFQ-R. The MBW set-up was identical to the one used in previous publications by Gustafsson et al and Aurora et al with the exception of the pneumotachograph which was replaced by a Hans Rudolph pneumotachograph (Rudolph Linear Pneumotach, Hans Rudolph, Shawnee, Kansas, USA).9–11 13 14 See the online supplement for additional details as to how the MBW was performed. Spirometry was performed according to American Thoracic Society (ATS) standards using the Vmax systems (VIASYS, Cardinal Health).18 Pulmonary function data for the inclusion criteria were corrected using the Weng and Levison normative values.19 Quality of life was assessed using the CF-specific CFQ-R. One of the three participant formats of the CFQ-R was used depending on the age of the participant: adolescents and adults (patients ≥14 years), children aged 12 and 13, and children aged 6–11. A parent questionnaire was completed in addition where appropriate as per the CFQ-R administration guidelines (for children aged 6–13 years).20 The instrument yielded a score of 0–100 for each domain, with higher numbers indicating better function on various domains.20 The CFQ-R was administered prior to lung function testing at each study visit. See the online supplement for a detailed description of how safety and compliance were assessed throughout the study. Repeated measures analysis of variance (ANOVA) was used to test the treatment effects of HS and IS on the LCI. This method was chosen because all study participants were measured under two different conditions (HS and IS treatments). A mixed effects model was used to perform the repeated measures ANOVA. The predictor variables for the model included treatment type (HS or IS), randomisation order (HS then IS or vice versa) and the treatment by randomisation order interaction. Similar models to that above were generated for each secondary outcome measure. Crossover trials are at risk of three sources of bias: period effect, sequence effect and carryover.21 The mixed models were evaluated for these potential sources of error. Baseline values that were not significantly different were consistent with no carryover effect. Randomisation orders that were not significantly different were consistent with no sequence effect. A non-significant treatment by randomisation order interaction was consistent with the absence of a period effect. Similar models to that above were generated for each secondary outcome measure. Data were analysed according to the intention-to-treat-principle. Descriptive statistics were used to describe the study population. Two group correlations (LCI and each secondary outcome measure) were performed using Pearson correlation coefficients for normally distributed data and Spearman correlation coefficients for all non-normative data. Normality was determined using the Kolmogorov–Smirnov test. The intravisit coefficient of variation (CV) was calculated for all visits (study visits 1–4). The intervisit CV was calculated using baseline study visits 1 and 3. We calculated the sample size required for testing using HS as the main exposure variable and the LCI as the primary outcome variable. Our estimate was based on the published baseline mean (standard deviation) LCI of 11.54 (2.86) for a population of CF school-age children from the UK.10 We estimated a treatment effect of 3.00±2.86 in the LCI from HS versus IS. Assuming a significance level of 5% and a power of 80%, 17 study participants would be needed to complete this crossover study.22 Based on an attrition rate of 20% from similar trials from our centre, we aimed to recruit a total of 20 patients or 17 patients that completed the protocol. p Values of <0.05 were considered statistically significant. The dropout rate for the study was lower than anticipated. Therefore, we stopped recruitment for the study after we had complete data for 17 patients. Spirometry percent predicted as well as z-scores were calculated using the Stanojevic et al reference values and these reference equations were used for statistical analysis.23 Statistical Analysis Systems software version 9.2 was used to conduct all analyses. Twenty patients entered the study and underwent randomisation (table 1, figure 1). The LCI results of one patient failed to meet the quality control criteria for all four study visits and were therefore excluded from the analysis. One patient receiving IS withdrew from the study after completion of the initial 4 week study period because of difficulties complying with the study protocol. One participant had uninterpretable LCI data at study visit 2. Complete crossover data were therefore available for 17 patients. Randomisation and disposition of study participants. The LCI was performed in triplicate during each testing occasion. The intravisit CV was 7.0% 95% CI 6.0 to 8.0) (see table 1 online). During the course of the study, patients returned for three more visits after the first visit. The two baseline visits for each treatment period were ∼8 weeks apart (mean (range) 8.3 weeks (6.7–10.1)); the CV for these two baseline visits or the intervisit CV was 9.2% (95% CI 7.5 to 10.9) (see table 1 online and figure 1 online). The LCI was significantly lower after 4 weeks of HS inhalation as compared with IS (7.86±1.71 vs 8.89±2.10; p=0.016) (figure 2, table 2). The LCI values for each participant before and after 4 weeks of HS and IS inhalation are shown in online table 2. Baseline LCI before IS was not significantly different from baseline LCI before HS inhalation (8.71±2.10 vs 8.84±1.95, p=0.73). Therefore, there was no carryover effect. The randomisation order had no significant impact on this treatment effect. (A and B) Lung clearance index (LCI) before and after treatment for each study participant as well as the mean and standard deviation for all study participants for the isotonic saline treatment period and the hypertonic saline treatment period. Diamonds refer to isotonic saline (A) and triangles refer to hypertonic saline (B). The p value represents the significance of the treatment effect of hypertonic saline calculated by repeated measures analysis of variance (p=0.016). Spirometry in percent predicted and litres as well as CFQ-R respiratory domain scores and CFQ-R parent respiratory domain scores were not significantly different after HS inhalation compared with IS (see table 2). Baseline values for the two study periods for all outcome parameters were not significantly different. FEV1% predicted values for each participant before and after 4 weeks of HS and IS inhalation are shown in table 2 online and figure 3. Spirometry z-scores were not significantly different from HS and IS inhalations (see table 3 online). The LCI significantly correlated with all secondary outcome measures. The strongest correlation was found between the LCI and FEV1% predicted (r=−0.61, p<0.0001) (see table 4 online). 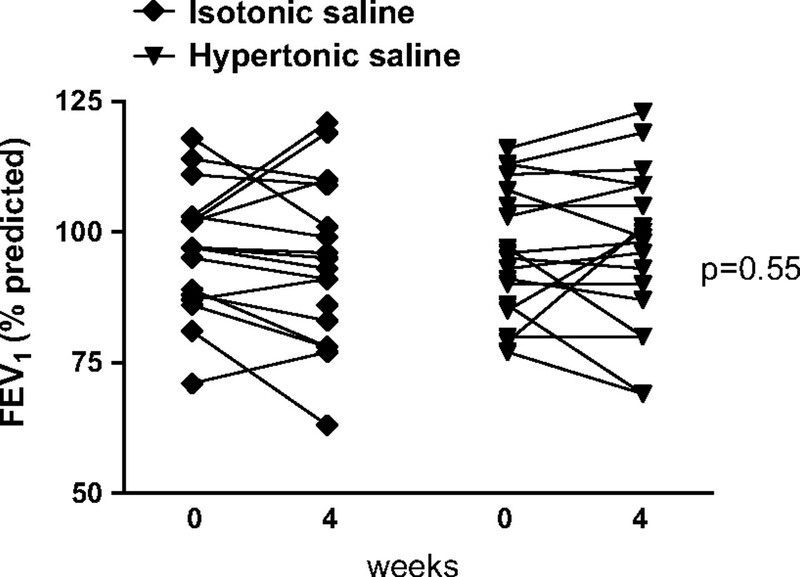 Forced expiratory volume in 1 s (FEV1) for each study participant before and after treatment for the isotonic saline treatment period and the hypertonic saline treatment period. Diamonds refer to the FEV1 before treatment and triangles refer to the FEV1 after treatment. The p value represents the significance of the treatment effect of hypertonic saline calculated by repeated measures analysis of variance (p=0.55). After administration of the first dose of assigned solution, the FEV1% predicted fell by a mean of 116±140 ml after HS inhalation and 41±88 ml after IS inhalation. None of the patients had a drop of FEV1% predicted ≥20%. There were significantly more overall adverse events during the HS treatment period as compared with the IS period (Student t test, p=0.0035). Adverse events included increased sputum production, fever, ear infection, rhinorrhoea, malaise and adverse drug reactions. Adverse drug reactions (ie, adverse events that in the opinion of the examining investigator were directly and temporally related to the inhalation of the trial solution) were not significantly different between the HS and IS inhalation treatment periods (Student t test, p=0.17) (table 5 online). Adherence to treatment, as judged by the number of returned ampoules, overall for both study periods was 95.3±31.24% for the HS study period and 84.47±19.28% for the IS study period. Better than 80% compliance was seen in 16/17 (94%) patients during the HS treatment and in 15/19 (79%) during IS treatment (p=0.20). In addition, there was no significant difference in compliance for HS in treatment period 1 versus treatment period 2 (p=0.26). Posthoc sample size calculations based on differences observed in the study were performed for all secondary outcome measures (table 3). The required sample sizes ranged from 61 for the CFQ-R Respiratory Domain to 351 for FEV1% predicted. This study is the first to demonstrate that the LCI is able to detect a treatment effect from an intervention known to improve mucociliary clearance in patients with CF with normal spirometric lung function. This finding is of significant importance since, due to the success of aggressive treatment, the majority of paediatric patients now have normal or only mildly reduced lung function when defined by spirometry. Multiple early intervention strategies are currently under development and previous studies have required large sample sizes or long periods of follow-up to detect treatment effects in milder patients—thus precluding the rapid integration of novel treatments into practice. In this study of short duration we were able to show a significant treatment effect in only 17 patients, whereas using other established surrogate markers such as FEV1 or quality of life measures, we would have required a much larger sample size. Furthermore, the small intervisit CV in our study further supports the responsiveness of the LCI as the improvement in LCI was beyond the 95% upper limit of the intervisit CV of 10.9%. Interestingly, the absolute improvement in FEV1 in our study of 62 ml is similar to the findings in the trial of Elkins et al,16 but the large variability in FEV1 in our study would have required a much larger sample size to power a study in which the primary outcome was FEV1 rather than LCI. Our findings are consistent with previous publications which demonstrate that the LCI is more sensitive than spirometry at detecting pulmonary disease among patients with CF.9–15 The LCI has been shown to reflect disease progression, correlating with FEV1, although it is abnormal at an earlier stage in the disease.12 Gustafsson et al have bridged structural and physiological measures of CF lung disease by comparing high-resolution CT (HRCT) scanning with both LCI and spirometry.14 LCI was found to be the most sensitive measure, and a normal LCI almost precluded an abnormal HRCT; whereas spirometry was found to be the least sensitive, often appearing normal despite the presence of disease documented by HRCT.14 Our study adds to the current body of literature by demonstrating for the first time that the LCI is a responsive outcome that can be used in patients with CF with normal pulmonary function. These findings in combination with the ability of the LCI to be applicable to children of all ages render it a promising end point for future early intervention trials in CF. Although significant, the mean treatment effect and variability of HS was less than what was anticipated in the sample size calculation a priori. This can be explained by milder pulmonary disease and lower baseline LCI among our study participants compared with the previously published paediatric population on which our sample size calculation was based.10 As pulmonary disease worsens and FEV1 decreases, variability in the LCI increases.9 10 This may explain why a smaller treatment effect still resulted in significance in this study. Our study was limited to a patient population that was able to perform technically adequate spirometry and, thus, it has not yet been established whether the LCI is a responsive outcome measure for a treatment intervention trial in the preschool population. Data from this study would support the utility of LCI in interventional studies, but many questions remain unanswered at present. The LCI has yet to be linked to mortality and it is therefore unknown if the LCI's sensitivity is truly a reflection of early CF lung disease or rather an epiphenomenon that is present but not connected with future disease progression and survival.10 While we have shown that LCI significantly correlates with FEV1 and quality of life scores, two surrogates of mortality, further longitudinal studies in patients with more significant lung disease are required to establish its link to survival in patients with CF.25 26 This poses a dilemma as mortality is rare in patients with mild disease, and the usefulness of the LCI may vary between patients with mild versus more advanced disease. In addition, while the present data support the use of the LCI as a surrogate outcome parameter for assessing pulmonary changes in mild CF lung disease, further longitudinal studies are required to determine the accuracy of the LCI as compared with spirometry. Furthermore, although the LCI improved in our study with HS treatment, the minimum clinically important difference for the LCI is not known at present. However, the question of clinical relevance is longstanding. We have shown that the LCI can detect a treatment difference in a small number of patients and thus can be a model to test drugs in development in early phase studies for CF. This of course has the potential to increase the rapidity with which new treatments may be introduced and tested in larger studies of effectiveness. The HS and IS were identical in terms of the appearance of the solution, volume and packaging, but the inhalation solutions had different tastes, with HS being much saltier. Once patients have tasted both solutions they would be able to differentiate between the two solutions and 94% of patients did indeed correctly guess their treatment allocation. Given this lack of blinding one would have expected differences in overall compliance for HS and IS. However, in our trial, there was no significant difference in compliance for the HS and IS treatment periods or between HS inhalation in treatment period 1 or 2. In summary, our data suggest that the LCI is both a sensitive and responsive outcome measure for interventional studies in patients with CF. Its ability to detect changes in a relatively small number of patients makes it an attractive candidate for early studies to evaluate therapeutic response to treatment approaches that target the underlying defect in CF.
. Bronchoalveolar lavage findings in cystic fibrosis patients with stable, clinically mild lung disease suggest ongoing infection and inflammation. Am J Respir Crit Care Med 1994;150:448–54.
. Early pulmonary inflammation in infants with cystic fibrosis. Am J Respir Crit Care Med 1995;151:1075–82.
. Inflammation, infection and pulmonary function in infants and young children with cystic fibrosis. Am J Respir Crit Care Med 2002;165:904–10.
. London Collaborative Cystic Fibrosis Group. Airway function in infants newly diagnosed with cystic fibrosis. Lancet 2001;358:1964–5.
. Australian Respiratory Early Surveillance Team for Cystic Fibrosis (AREST-CF). Lung disease at diagnosis in infants with cystic fibrosis detected by newborn screening 2009;180:146–52.
. AREST-CF. Lung function in infants with cystic filbrosis diagnosed by newborn screening. Am J Respir Crit Care Med 2008;178:1238–44.
. Introduction: the rationale for early intervention in cystic fibrosis. Pediatr Pulmonol 1997;24:132–3.
. An overview of endpoints for clinical trials in cystic fibrosis. One size does not fit all. Proc Am Thorac Soc 2007;4:299–301.
. Evaluation of ventilation maldistribution as an early indicator of lung disease in children with cystic fibrosis. Eur Respir J 2003;22:972–9.
. Multiple breath inert gas washout as a measure of ventilation distribution in children with cystic fibrosis. Thorax 2004;59:1068–73.
. London Cystic Fibrosis Collaboration. Multiple-breath washout as a marker of lung disease in preschool children with cystic fibrosis. Am J Respir Crit Care Med 2005;171:249–56.
. Ventilation inhomogeneities in relation to standard lung function in patients with cystic fibrosis. Am J Respir Crit Care Med 2005;171:371–8.
. London Cystic Fibrosis Collaboration. Early detection of cystic fibrosis lung disease: multiple-breath washout versus raised volume tests. Thorax 2007;62:341–7.
. Multiple-breath inert gas washout and spirometry versus structural lung disease in cystic fibrosis. Thorax 2008;63:129–34.
. Lung clearance index is a sensitive, repeatable and practical measure of airways disease in adults with cystic fibrosis. Thorax 2008;63:135–40.
. National Hypertonic Saline in Cystic Fibrosis (NHSCF) Study Group. 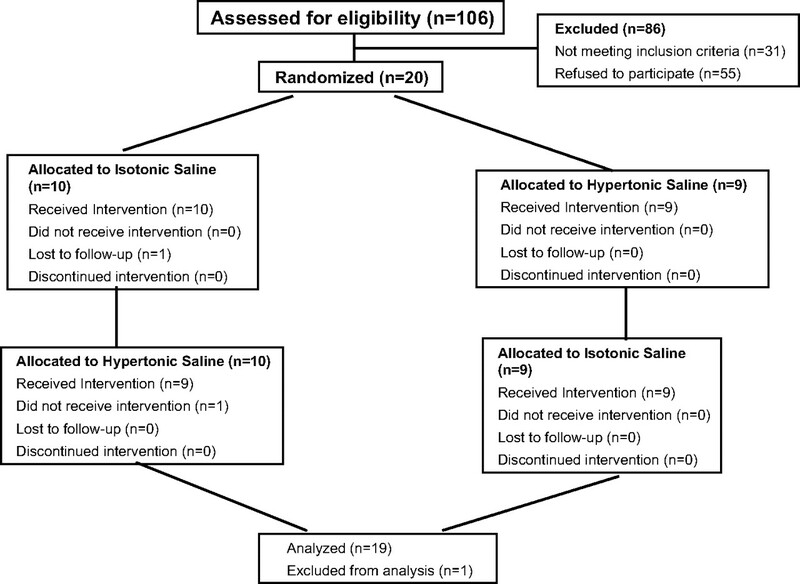 A controlled trial of long-term inhaled hypertonic saline in patients with cystic fibrosis. N Engl J Med 2006;354:229–40.
. Mucus clearance and lung function in cystic fibrosis with hypertonic saline. N Engl J Med 2006;354:241–50.
. ATS/ERS Task Force. Standardisation of spirometry. Eur Respir J 2005;26:319–38.
. Standards of pulmonary function in children. Am Rev Respir Dis 1969;99:879–94. Manual Scoring Instruction for the CFQ-R, Alexandra Quittner, obtained through email via Ivette Cruz. http://www.icruz@miami.ir.miami.edu.
. Cross-over trials in clinical research. Chichester: John Wiley, 1993.
. http://www.hedwig.mgh.harvard.edu/sample_size/size.html (accessed Jul 2007).
. Reference ranges for spirometry across all ages: a new approach. Am J Respir Crit Care Med 2008;177:253–60. http://www.clinicaltrials.gov/, NC NCT00789867 (accessed Aug 2009).
. Determinants of mortality from cystic fibrosis in Canada, 1970–1989. Am J Epidemiol 1996;143:1007–17.
. Can health-related quality of life predict survival in adults with cystic fibrosis? Am J Respir Crit Care Med 2009;179:54–8. RA and PS contributed equally to this work. Funding Canadian Institute of Health Research the Canadian Cystic Fibrosis Foundation-Breathe Program and the Irwin (Arnold and Lynn) family donation. Ethics approval This study was conducted with the approval of the Ethics Board of the Hospital for Sick Children, and Health Canada. © 2010, Published by the BMJ Publishing Group Limited. For permission to use (where not already granted under a licence) please go to http://group.bmj.com/group/rights-licensing/permissions.